Some boards get cut up and made into things ... and that’s the end of that. Other boards do a job, such as being a form for concrete work ... and then they go to the burn pile. But we know of some special boards that performed many jobs in two countries and across the high seas, yet may now have found their final place in the world ... and they may be doing that final job for a long time. Mezzanine goes into the sea container. Back in Houston, about a year ago, I realized that we were pushing the limit of what a 40-foot sea container could hold, due to the volume of “stuff” we were taking to Costa Rica, along with the space to be taken up by our Subaru Forester. So, I designed a “mezzanine” decking to be assembled around and over the Subaru which would create quite a bit of useable space above the car – space which would normally be “dead air” where nothing could go. As a plus, this wooden cage would protect Subie from shifting cartons or falling stuff while out on the heaving ocean. 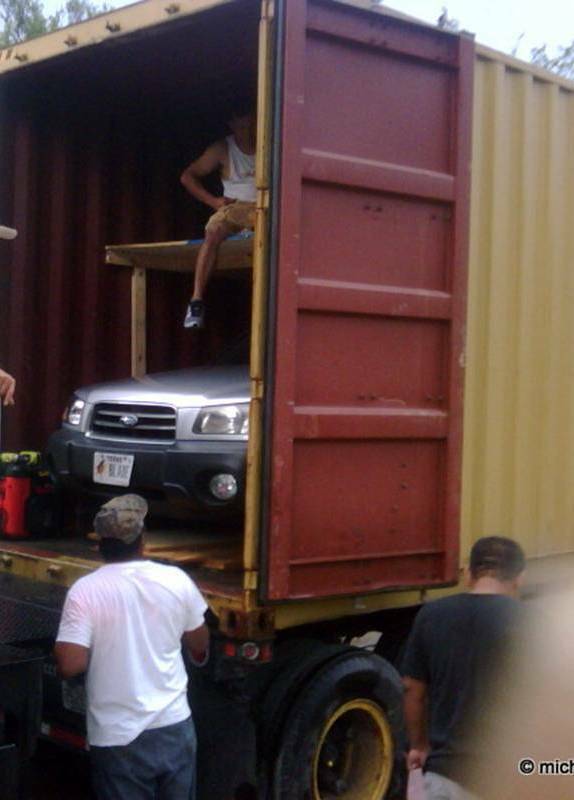 Well, they did the mezzanine job just fine, crossed the ocean, got removed from the container and showed up in Atenas, CR, with all of our junk. Really. Used lumber. Oh, well, it made the trip so I leaned it up against the tapia (our property perimeter wall). THERE! 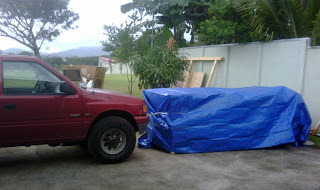 Hiding behind the blue tarp. 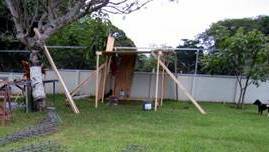 We had no more than begun breaking ground for construction of our “Rancho” (party-patio) when our contractor came up and asked if they could use the plywood and 2x4’s, temporarily. Why not? They put everything back together almost exactly like the sea container mezzanine and this became protection for the guys and for building materials from the sun and rain. Those sheets of plywood took a direct beating from the elements for months and they took on a kind of dirty grey-brown look. But they held together just fine. Kind of small and rickety but Da Boyz loved it. Before starting on the main house, the contractor built our “Bodega” (storage building) so there was no need for the poor old plywood mini-bodega up at the Rancho. They took it apart and leaned the boards back against the tapia. No sooner had they scratched the earth for the house foundation when it became obvious that we needed to break the tapia open so that the large volume of construction materials could be unloaded and brought in from the road “down there” at the house site, rather than hiked all the way from the driveway, up at the Casita. Trouble was, we didn’t want the big gap in the wall to be left open at night. Hey ... plywood! The guys started out the “closure” of the tapia opening by just leaning two of the plywood sheets against the edges of the gap. Pretty soon though, the dry season winds came and the plywood would get blown down almost as fast as they could pick it up and put it back. But, the guys didn’t “get it” since "quitting time" was the only time when they would stand up the plywood, close the gap, jump in the crew truck and be gone -- before the wind could blow the sheets down (some times.) So, the solution was up to me. I built a giant bolted-on tongue and groove assembly which locked the two sheets together in the middle while a rope (eventually a chain) across the downwind side of the closure would keep this wooden wall from collapsing. This worked for many more months, as the plywood sheets became sadder and sadder looking. One sheet down ... one sheet up. The Closure. As the rainy season came back and construction started into the home stretch, our wrought iron gate was installed across the opening in the tapia (site of the new driveway) and the Big Bad Boards went – guess where – back to leaning against the tapia. But are The Little Plywood Sheets That Could down for the count? Nah. As told in an earlier post, the Brave, Courageous and Bold guardian of the Kingdom, Don Newt, had been sleeping on an air mattress inside the casa for several weeks protecting our new stuff from thievery and thuggary during the hours of darkness. But it came to pass that I COULDN’T STAND IT NO MO, so we gagged and choked up the two bucks an hour and hired Jesus, er, I mean Jesús to patrol the grounds and sleep with the bugs every night. And a darn good job he does, too. 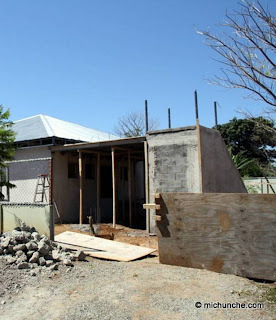 The other morning, Jesús spake (sorry ... da devil made me do that) and asked if we had any plans for the two sheets of plywood leaning against la tapia. Seems his mattress at home was sagging badly and he figured ¾”plywood sheets would be just the ticket to bolster up the bow in the bedding. Holy crow – an opportunity to get those nasty looking things out of my everyday sight, after 10 months! 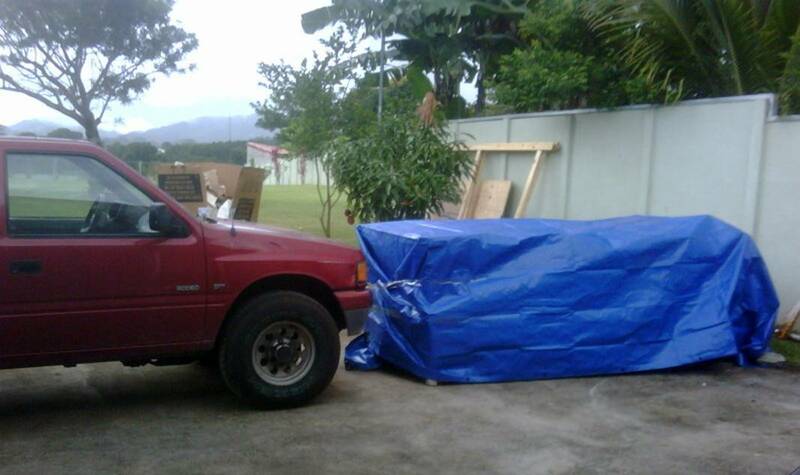 So, today, those two sheets, which started life protecting Subie and giving us room, were hauled by Subie and taken to the room of Jesús, where they may rest, quietly retired, beneath his mattress, doing a job where appearance means nothing and their proven strength is everything.